An easy to follow manual for complete beginners. The sheer size of the book can seem daunting, though it is broken down into simple pieces. There are many young people in the world who are tech-savvy, incredibly comfortable with computers, and well on their way to become proficient at the type of computer programming that makes all of our lives easier, every time we power up our phones, turn on computers, or relax with a game. For these people, there are a number of programming books available to help them learn in depth techniques for everything from writing complicated code to designing a game. But there is also another large group who doesn’t have nearly as many how-to books to choose from. These people are fairly skilled in day to day computer usage – enough to get by anyway. They know how to do things like creating spreadsheets and documents, send emails, upload pictures, conduct web searches, and so forth. What they don’t know how to do is use the power of their computer to do that stuff for them. 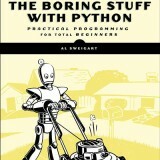 Automate the Boring Stuff with Python is a book created for just that sort of person. Because it operates on the assumption that its readers are comfortable with computers but complete novices to programming, it is set up a little differently than most programming manuals. For one thing, it doesn’t always direct readers to use “best practice”. Instead, it focuses on teaching the technique that will be easiest to learn, even if it isn’t always the one that would be best for more complicated programming. Using that method, the book presents the idea of basic programming in a way that is not nearly as intimidating as it often seems. Beginning with teaching the basics of programming that will be needed to implement the strategies in the book, Automate the Boring Stuff with Python leads readers gently into the world of writing code, one simple step at a time. This includes some of the common terms used, as well as a little bit of explanation on how computers “think”, and it gives an important base to beginners as they begin learning simple code. It even gives a little lesson in proper internet etiquette when asking for help with coding problems, and provides practice questions at projects to reinforce each lesson. As the title suggests, this is a book to help learn how to automate boring and time consuming tasks, and part two of the book provides extensive instructions on how to do just that. From managing emails, to manipulating images, to spreadsheets and pdfs, there is a wealth of time saving ideas to make the most of your computer’s capabilities – without completely going over your head. Of course, not every program in the book will be needed for most, but the variety allows you to pick and choose which things are of value to you, as well as just giving a better understanding of how programming works in general. 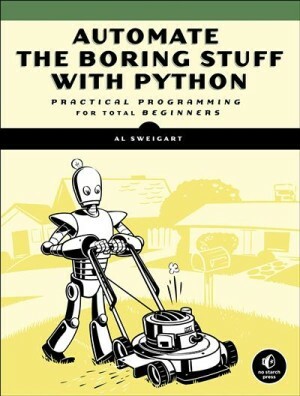 For programming novices who just want to maximize their screen time without getting a headache, Automate the Boring Stuff with Python is the perfect manual to get their computer doing the busywork. It’s written in easy to understand language with a gentle approach that keeps confusion to a minimum, and provides specific instructions when needed for Mac, PC, and Linux. Regardless of your operating system, you’ll be writing your first bits of code in no time at all.